Brackley Town face potentially their most testing trip of the Vanarama National League North campaign on Tuesday. Saints make the long trek to long-time leaders Chorley looking to extend their seven-match unbeaten run. Saints go into the game on the back of a 3-1 victory over AFC Telford United while Chorley were rocked by a 5-3 defeat at Southport on Saturday. Even so, Saints boss Kevin Wilkin knows it will be a tough test, especially in midweek. 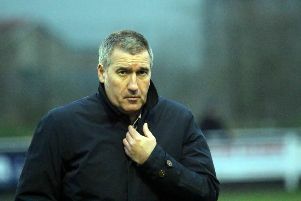 He said: “Chorley is a difficult place to go, especially for a midweek game. They’re having a fantastic season, so we’ve got to be ready to go again on Tuesday. Looking back on Saturday’s success, Wilkin added: “We did fantastic to go 3-0 up in the first half. It was disappointing to concede just before halftime but that kept us on our toes for the second half. “The way we went about our business in difficult conditions was excellent. We had to play into the elements in the second half and I knew that if we could score three goals playing with it then so could Telford.